Interior designer for the stars, Jeff Andrews, shows off his own place in Home Magazine. Built in 1924, this 1,400sf home was in desperate need of a make-over. 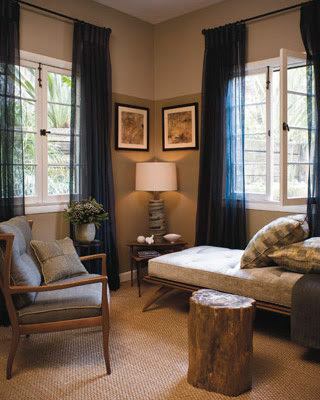 Jeff wanted to maximize the cozy space to create an updated, sophisticated look and feel. His home is beautiful and inspiring! "I've found that a really dark color in a low-sheen finish has no boundaries to it; it's less space-defining, which makes a room appear larger," Andrews says. Newly installed wall sconces reflect light off the paint's satiny surface, adding to the sense of spaciousness. "Brilliant use of color, clever furniture placement, and inspired juxtaposition of decorative styles make Andrews' layout uniquely his own. "Everything in this home is a direct reflection of who I am as a person and a designer, which I think every home should be." (Quotes and photos from Point Click Home). beautiful! i love the richness of the colors and the feel of the rooms. very inspiring!